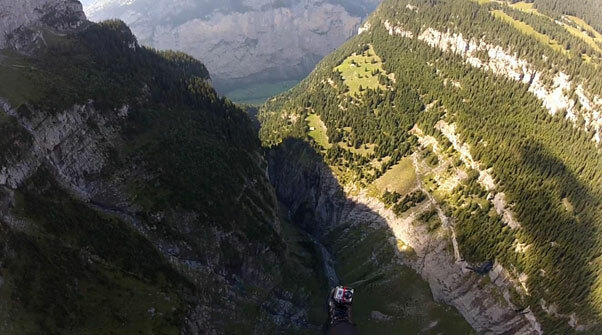 Nabik Daniel Hunt, known as ‘Nabik’ or ‘Dan’ by close friends and family, was speed flying in Switzerland with two friends on Saturday, September 15, 2012. 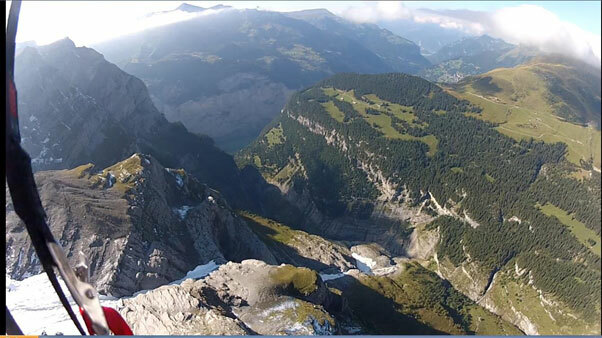 After a successful launch from the Jungfraujoch at a height of 11,333 feet, he did not land back in Lauterbrunnen Valley as planned. Search and Rescue efforts began as soon as his companions realized that he was not behind them. Since Saturday afternoon, Nabik’s companions helped the Swiss Search and Rescue and military to find their missing friend. When it was made apparent that Dan Hunt’s insurance was exhausted to cover the cost of the helicopter, an appeal was launched via Facebook for donations towards the rescue operations. The response has blown everyone away. Many many thanks to all who supported this effort. Tim Good, who was flying with Dan, constantly updated his family and friends with the progress of the search, and has been looking for Dan continuously since his disappearance on Saturday. The efforts to-date included mountaineers scaling the glacier, paragliders searching over the forested area, search dogs, more people on foot, and speed-flyers that re-flew the line to see where Dan might have gone down. The operations today were focused mainly on a concentrated area of the Gorge. At approximately 12:20 GMT (London) on September 20, 2011, news was received Nabik (Dan) was found alive and well - sitting in a cave, at the bottom of the gorge 40 feet wide and 150 feet deep. The rescuers, friends of Nabik, and four German Mountain Infrantry Officers, lowered themselves down into the gorge and secured him in a harness, pulling him to safety. Shortly after, a rescue helicopter then arrived to pick him up. He was taken to hospital to be assessed for injuries. 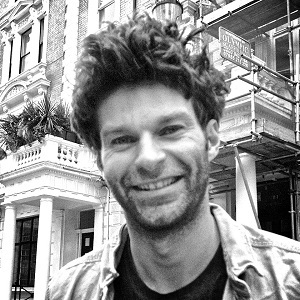 “He is in good spirits and is overwhelmingly fine”, said Nadeem Al-Khafaji, a close friend of Dan’s and one of the rescuers. Nabik spoke to friends and family back in the UK. “I am so grateful, touched, and humbled by all the help... thank you from the bottom of my heart”. Mr. and Mrs. Hunt are overwhelmed with the support from friends, family and from the wider speed-flying community. They are so grateful to everyone who donated their time, money and energy to help find Nabik. The alarm was raised immediately but a search of the area has so far failed to find him. A fundraising campaign has been set up to help pay for more helicopter air time. The Jungfraujoch is a col between the Mönch and the Jungfrau in the Bernese Alps. 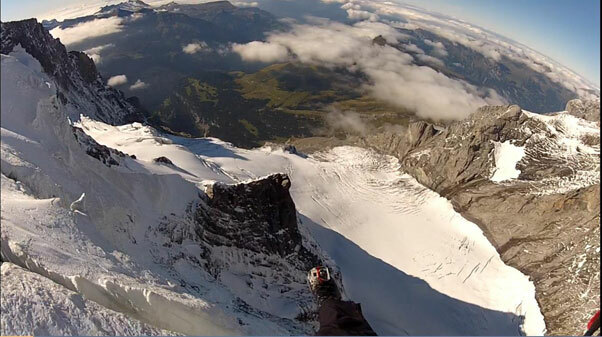 It is 3,471m hight and is close to the mountain railway station the Jungfraubahn, the highest rail station in Europe. The area accommodates all sorts of air sports – from hang gliding to wingsuiting. As the search entered its fourth day on Tuesday Kara De-los-Reyes, a friend in London who is helping to coordinate the rescue, said everyone was still focused on finding Dan. 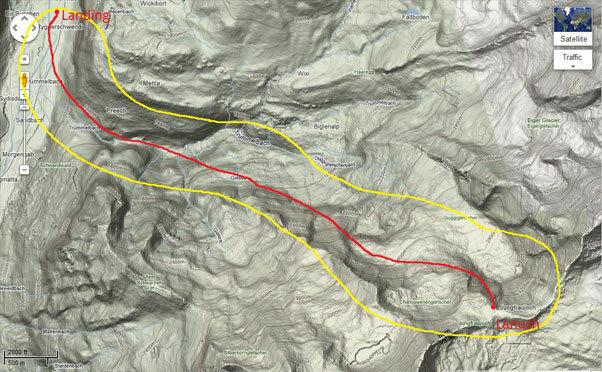 Before launching the three pilots had discussed the route and agreed to land in the valley on the right side, avoiding a Base jumping competition on the left side of the valley. Dan was carrying a mobile phone and it was switched on, Kara said. However, an attempt at locating him through triangulation on Saturday night failed. He was not carrying a Spot or other tracking device. The Swiss authorities had been “amazing” Kara said. However, after two free search and rescue flights the search and rescue helicopter must be paid for, she said. Although insured, Dan’s insurers have refused to fund more of the search, hence the appeal for funds through Facebook and Paypal. searching for him we need your help to raise funds. Dan's insurance is now exhausted, and his family have already covered the second deployment, but are struggling. We need at least £6,000 to launch another helicopter search.